Hi everyone. Hope you had a great Thanksgiving. Laurie and I made a full turkey feast here in our little kitchen (yup, still in the camper for a couple more months), and it was a very relaxing day of food, football, and even some work thrown in. Yes, I worked some of my Thanksgiving, but I love my work so it's no big deal. Hey, this might be a record for me - it's only been about a month since the last newsletter. For those of you new subscribers, it's usually quite a few months between my newsletters. One of the reasons I felt compelled to write another newsletter so quickly is because of all the new subscribers. I've never had so many new subscribers in a one month period. And they keep coming in everyday - here's another notice just came in. So where are all you folks coming from anyway? Somebody send me an email and tell me how you found out about the Volti Audio newsletter. Unlike other audio companies, I don't sign up my own subscribers to the newsletter. Most companies automatically sign you up for their newsletter if you purchase something from them, or contact them for any reason, or if they get your email address from a list, etc... By contrast, every single one of my subscribers has signed up for the newsletter on their own, so it's very nice to see so many new people joining us here over the last month. there's some really good reading there. I suspect the extra activity with subscribers may have to do with all the attention Volti Audio has been getting in Stereophile Magazine lately. "The Rivals played music with supreme fidelity, openness, lifelike images, transparency, impact, touch, timing, dynamics, and flat-out musical fun"
I know Ken really enjoyed his time with the Rivals, and his enthusiastic words of praise really helped push sales for us. 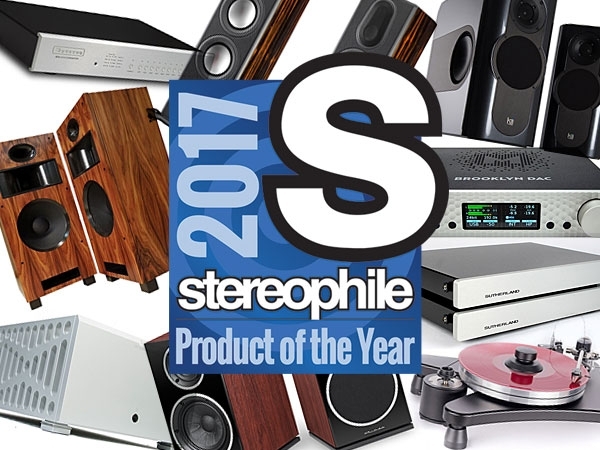 The Volti Audio Rival also became a Stereophile Recommended Component in the 2017 Fall Special Edition magazine. This is a real honor for Volti Audio, and to now have two speaker models that have received this recognition in our relatively short time in business is very special. I was at the Capital Audio Fest when someone came up to me and told me about the Product Of The Year/Editors' Choice recognition. I had no idea that was coming. The Rival was also in the running for Loudspeaker Of The Year. All of these recognitions are very special for a little company like Volti Audio, competing with all the Big Boys in the industry. We've also been doing some advertising in Stereophile magazine, along with BorderPatrol Audio and Triode Wire Labs. Have any of you seen the ad? You know I like to hear from you, so please let me know what you think of it. Capital Audio Fest was a blast this year. Teaming up with the usual suspects, BorderPatrol Audio and Triode Wire Labs , showing the same system that we used at the California Audio Show, the LA Audio Show, and AXPONA earlier in the year, we made one of the best sounds at CAF. Seriously . . . do it! 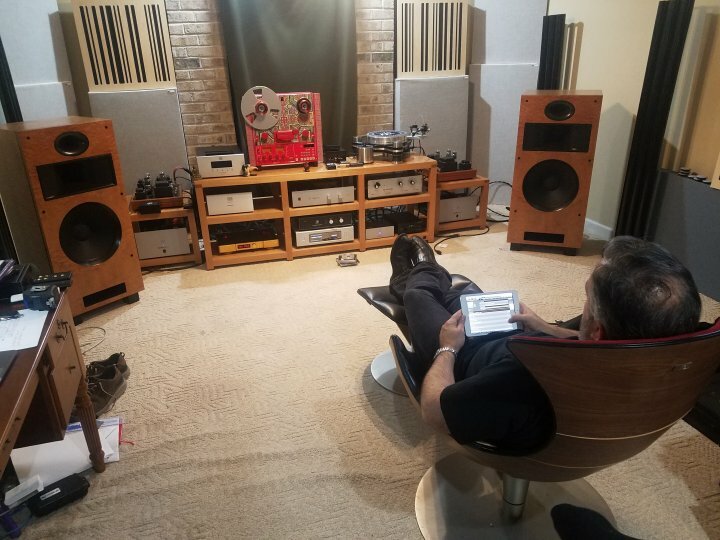 Go right downstairs and sit in the room with the million dollar stereo system and listen to a song or two, then come right up here to room 316 and sit in front of our system. What do you think? How can our $30,000 system be SO MUCH better? It just doesn't make sense does it? But that's the reality of our industry. The sound from our system is dynamic, exciting, and effortless. Music just flows from this system in the most natural, engaging, and compelling way - exactly like listening to a live musical event. You should all come to an audio show sometime so you can experience this for yourself. 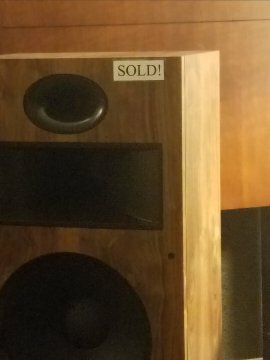 I sold the 2017 Rival show speakers in the hour before the show opened on Friday! That was cool. Monday morning after the show, on my way to deliver the speakers to my customer, my truck broke down - crawling in traffic at 15mph in "reduced power mode", hauling a big trailer. That was not cool. But I managed to get it to a dealer to fix it, and Gary Dews (who lives nearby) came to my rescue. We loaded the speakers into the back of his van and delivered them to my customer. 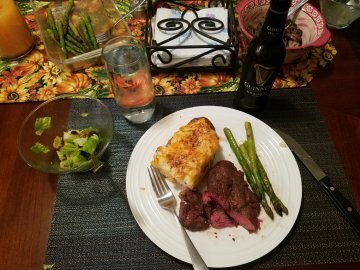 We had good company, good music, good beer, and a great meal that evening. I have a VERY happy customer in Reston, VA. It was going to take a couple of days to get the truck fixed, so Gary let me stay at his place. I was told to make myself at home, so I had a great time (in a geeky way) looking all over his parts room in his workshop. I also became very familiar with all the items in the pantry and refrigerator. I enjoyed spending time with "Mikey" (lost both my dogs a couple of years ago and really miss them). Listened to music on the Dews systems, which sounded quite nice, not suprisingly. I was introduced to "Peaky Blinders". I even did a little work for Gary on some DAC parts. Generally, I had a grand couple of days off at "Chez Dews" - thanks Gary! 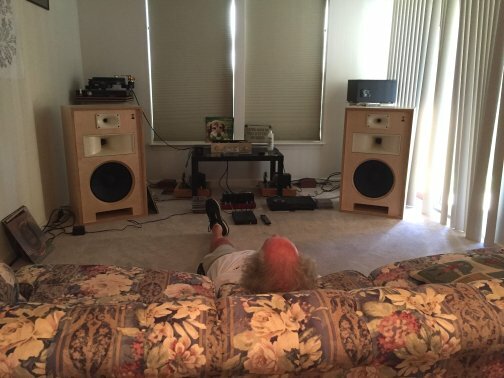 Before CAF, I stopped by Scot Hull's place to drop off his Rival speakers. Scot purchased a pair veneered in a beautiful Bosse Cedar. He wrote about it in his most recent newsletter. Hey! Yup, this is one of those links you should really click on, you'll love it. Sign up for "The Occasional Newsletter"
I finally picked up my truck from the dealer ($1,800 - ouch) and headed up to Maine to get load #7 of 10. I did some visiting of course, and also snuck in an afternoon at the Bangor Symphony Orchestra - front row, hmmm, hmmm, yeah. Then back to Maryland again to visit with my customer Robert who bought the prototype Rival speakers at CAF2016. I changed out the prototype crossovers for the current version, and in a nerdy kind of way, really enjoyed hearing my previous work compared to my most recent. 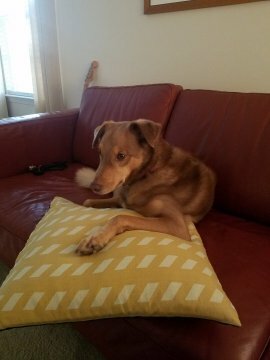 I have a VERY happy customer in Edgewater, MD. Finally, 16 days after leaving on my trip, I was back home in Baxter, TN with a freighted trailer and a few bucks left in my pocket. A full and rewarding trip overall. Thank you for finishing The Rivals to a true furniture grade finish. Your attention to detail, combined with your craftsmanship of working with wood, electronics, stain and the paint booth are to be commended. The Rivals present a clarity, speed, dimensionality and tactile projection of any music that I hear through them. As I sit and listen with my eyes shut, the equipment disappears, and my room is filled with music in a way that I have not experienced before. I will cut to the chase to tell you both that I am absolutely THRILLED with the Rivals. In 50 years of tinkering with Hi Fi, they are the best I have ever heard. Beautiful sound, and quality-built with obvious loving care. I've been asked many times over the years if I think Bi-Wiring is a good idea, and my response has always been that I've heard from other people that it makes an improvement, but I've never taken the time to investigate it myself. Well now I can say I have listened to Bi-Wired Rival speakers versus single wired, and there is a clear improvement to the sound of the system with Bi-Wiring. 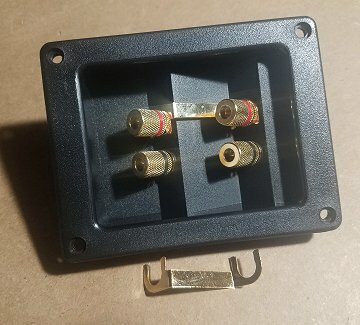 Some of the improvement that I heard was certainly due to the removal of the metal connectors that come with the input cups I use on the Rivals. You look at these gold-plate colored metal tabs and you think they would be good at conveying the signal from one set of binding posts to another. But I can tell you that replacing them with short wire jumpers made with Triode Wire Labs raw speaker cable, makes a difference you can hear in just the first ten seconds of listening to a song. How can that be? A real difference by replacing just that little bit of metal? I know it's hard to imagine, but it's true. The bottom binding posts in the Rival are connected directly to the woofer crossover network, and the top binding posts are connected to the upper horns crossover network. So if you remove the jumpers and put a signal into the lower binding posts, that signal only goes through to the woofer, and the upper only to the upper horns. When they're connected with jumpers and you put a signal into one set of binding posts, the signal is routed through the jumpers to the other set of binding posts so that both crossovers are getting the same signal. But are they? This whole experiment started when we (Pete Grzybowski, Gary Dews, and myself) discovered that the speakers sounded different if the input went into the bottom binding posts versus the top binding posts. So when the signal went into the top binding posts and directly to the upper horns, with the signal to the woofer being jumped down from the top binding posts, that sounded different than the other way around. I preferred the input going to the bottom binding posts. But this wasn't cool, either way! Those stupid metal jumper tabs were messing with the sound. Jumper wires helped, and this led us to trying two wires from the amplifier plugged into the top and bottom binding posts of the speaker - Bi-Wiring. That's when we got the best sound. 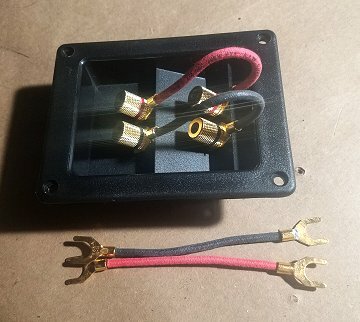 So I'm making a bunch of these wire jumpers, using nice large spade connectors and short pieces of raw TWL speaker cable, and I'll be sending them out to all my Rival customers. I'll also be including these jumpers with every new pair of Rivals. I'm going to make a change to the Vittoras so they can be Bi-Wired. And all future models of Volti speakers will be Bi-Wireable. That's it for this edition of the Volti Audio Email Newsletter. I hope you enjoyed it. Look for Volti Audio at the next audio show on the schedule, AXPONA in Chicago April 13 - 15, 2018. I had originally planned to bring the Vittora system to that show, but after learning that all the rooms have built-in, 11' long by 2' wide credenzas that limit the available space in the room, I think we'll be going with Rivals now. That's what happens when you have non-audio people involved in the organization of an audio show - the emphasis goes on how pretty the hotel is, and how much parking there is, and not on the most important things, like how will the exhibitors be able to make a good sound in their rooms. It's very frustrating for me, because my number one job at a show is to make a good sound, and if a compromised room is going to cause me to make a mediocre sound, I might be better off not doing the show at all. I'll keep you posted on this. Thank you for your support, and until next time, trust your ears and Have Fun!